M. Berend, Paris, by 1886. (Durand-Ruel, Paris), c. 1900; (Durand-Ruel, New York), by 1903; purchased 18 January 1909 by the Corcoran Gallery of Art, Washington; acquired 2014 by the National Gallery of Art. Berend was the lender of the painting to the Eighth Impressionist Exhibition in 1886. 8me Exposition de Peinture [Eighth Impressionist Exhibition], 1 Rue Laffitte, Paris, 1886, no. 7. Exhibition of Paintings and Pastels by Mary Cassatt, Durand-Ruel Galleries, New York, November 1903, no. 9, as La femme au chien. Seventy-Second Annual Exhibition, Pennsylvania Academy of the Fine Arts, Philadelphia, January-February 1903, no. 37, as Le Femme au chien. 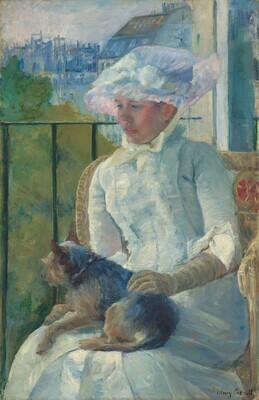 Paintings, Pastels and Etchings by Mary Cassatt, Durand-Ruel Galleries, New York, 1906, as La femme au chien. Second Exhibition: Oil Paintings by Contemporary American Artists, Corcoran Gallery of Art, Washingon, December 1908-January 1909, no. 252, as La femme au chien. Twelfth Annual Exhibition at the Carnegie Institution, Pittsburgh, April-June 1908, no. 49, as Woman with Dog. Survey of American Painting, Carnegie Institute, Pittsburgh, 1940, no. 201, as La femme au chien. Mary Cassatt: The Catalog of a Comprehensive Exhibition of Her Work, Baltimore Museum of Art, 1941-1942, no. 18, as Woman with a Dog. American Portraits, Watkins Gallery, American University, Washington, March-April 1949, unpublished checklist, as Woman with a Dog. De Gustibus: An Exhibition of American Paintings Illustrating a Century of Taste and Criticism, Corcoran Gallery of Art, Washington, January-February 1949, no. 29, as Woman with a Dog. Expatriates: Whistler, Cassatt, Sargent, Munson-Williams-Proctor Institute, Utica, 1953, no. 19, as Woman with a Dog. Centennial Exhibition: Pennsylvania Painters, Pennsylvania State University Museum, University Park, 1955, no. 37, as Woman with a Dog. Loan Exhibition. Masterpieces of the Corcoran Gallery of Art: A Benefit Exhibition in Honor of the Gallery's Centenary, Wildenstein, New York, January-March 1959, unnumbered catalogue, repro., as Woman with a Dog. The American Muse: Parallel Trends in Literature and Art, Corcoran Gallery of Art, Washington, April-May 1959, no. 55, as Woman with a Dog. Paintings, Drawings, and Graphic Works by Manet, Degas, Berthe Morisot and Mary Cassatt, Baltimore Museum of Art, 1962, no. 104, as Woman with Dog. Past and Present: 250 Years of American Art, Corcoran Gallery of Art, Washington, 1966, unpublished checklist, as Woman with a Dog. Mary Cassatt 1844-1926, National Gallery of Art, Washington, 1970, no. 29, as Susan on a Balcony Holding a Dog. Faces from the World of Impressionism and Post-Impressionism, Wildenstein, New York, 1972, no. 29, as Susan on a Balcony Holding a Dog. American Impressionist Painting, National Gallery of Art, Washington; Whitney Museum of American Art, New York, Cincinnati Art Museum, North Carolina Museum of Art, Raleigh, 1973-1974, no. 14, as Susan on a Balcony Holding a Dog. Corcoran [The American Genius]. Corcoran Gallery of Art, Washington, 1976, unnumbered catalogue, as Susan on Balcony with a Dog. La Pintura de los Estados Unidos de Museos de la Ciudad de Washington [Painting in the United States from Public Collections in Washington], Instituto Nacional de Bellas Artes, Mexico City, 1980-1981, no. 20, as Susana en un Balcón, Sosteniendo un Perro. The New Painting: Impressionism 1874 - 1886, National Gallery of Art, Washington; M.H. de Young Memorial Museum, Fine Arts Museums of San Francisco, 1986, no.137. American Women Artists, 1830-1930, National Museum of Women in the Arts, Washington; Minneapolis Institute of Arts; Wadsworth Atheneum, Hartford; San Diego Museum of Art; Meadows Museum, Southern Methodist University, Dallas, 1987-1988, no. 7, as Susan on a Balcony Holding a Dog. American Impressionism, Thyssen Bornemisza Foundation, Castagnola-Lugano, 1990, no. 2, as Susan on a Balcony Holding a Dog. The Century Club Collection, Corcoran Gallery of Art, Washington, 1990, unpublished checklist, as Susan on a Balcony Holding a Dog. Mary Cassatt: Modern Woman, Art Institute of Chicago; Museum of Fine Arts, Boston; National Gallery of Art, Washington, October 1998-May 1999, no. 45. The Forty-Fifth Biennial: The Corcoran Collects, 1907-1998, Corcoran Gallery of Art, Washington, 17 July - 29 September 1998, unnumbered catalogue, as Susan on a Balcony Holding a Dog. The Gilded Cage: Views of American Women, 1873-1921, Corcoran Gallery of Art, Washington, 2002, unpublished checklist. Encouraging American Genius: Master Paintings from the Corcoran Gallery of Art, Corcoran Gallery of Art, Washington; Museum of Fine Arts, Houston; Parrish Art Museum, Southampton; Mint Museum of Art, Charlotte; John and Mable Ringling Museum of Art, Sarasota, 2005-2007, checklist no. 52. American Impressionism: A New Vision, Musée des Impressionismes, Giverny; Scottish National Gallery of Modern Art (Modern Two), Edinburgh; Museo Thyssen-Bornemisza, Madrid, 2014-2015. Corcoran Gallery of Art. Handbook of the American Paintings in the Collection of the Corcoran Gallery of Art. Washington, 1947: 52, as Woman with a Dog. Brown, Milton. One Hundred Masterpieces of American Painting from Public Collections in Washington, D.C. Washington, 1983: 82. Gerdts, William H. American Impressionism. New York, 1984: 38. Wilmerding, John, ed. In Honor of Paul Mellon, Collector and Benefactor. Washington, 1986: 44. Mathews, Nancy Mowll. Mary Cassatt. New York, 1987: 57, 62. Pollock, Griselda. Vision and Difference: Feminity, feminism, and histories of art. London and New York, 1988: 56. Gerdts, William H. Masterworks of American Impressionism. New York, 1990: 26. Wolff, Janet. Feminine Sentences: Essays on Women and Culture. Los Angeles, 1990: 59. Effeny, Alison. Cassatt. London, 199: 21-22. Boone, M. Elizabeth. "Bullfights and Balconies: Flirtation and Majismo in Mary Cassatt's Spanish Paintings of 1872-1873." American Art(Spring 1995): 62, 65. Costantino, Maria. Mary Cassatt. New York, 1995: 12. Larkin, Susan G. "Mary Cassatt, Young Girl at a Window." In Corcoran Gallery of Art: American Paintings to 1945. Edited by Sarah Cash. Washington, 2011: 34, 37, 164-165, 272, repro. "The Corcoran Gallery of Art - A New Beginning." American Art Review 26 (March-April 2014): 139.